Revealing the results of the annual Monitoring the Future (MTF) survey of drug use and attitudes among American middle- and high-school students is an annual mid-December ritual at NIDA. It is often an unveiling of interesting and sometimes surprising data and trends. For 41 years now, the MTF results gathered by the University of Michigan have given us the ability to track trends in substance use among the most vulnerable population in our country. This year the results were mostly positive, giving us cause for encouragement. 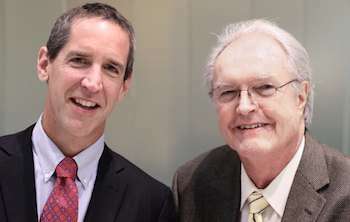 Dr. Lloyd Johnston (right) at University of Michigan has been the Principal Investigator of the Monitoring the Future survey since its inception in 1975. Co-Investigator Dr. Richard Miech joined the project in 2013. Use of most substances in 2015 continued their flat or downward trends seen in recent years—many dropping to the lowest levels in the history of the survey. This is true of both alcohol and cigarette use, for example. Fewer 12th graders than ever (17.2 percent) reported binge drinking (five or more drinks on a single occasion in the past two weeks) and fewer than ever (37.7 percent) reported being drunk in the past year. Among seniors, 5.5 percent reported daily cigarette smoking, down from 6.7 percent a year ago and 24.6 percent at its peak in 1997. This decline in cigarette use means that, for the first time, fewer seniors are daily cigarette smokers than are daily marijuana users. Use of inhalants, traditionally a concern in the youngest age groups, was at its lowest levels ever, and the drop in lifetime use of these substances since last year’s survey was significant among 8th and 10th graders (9.4 percent and 7.2 percent, respectively, down from 10.8 percent and 8.7 percent last year). Use of synthetic cannabinoids (sometimes called “synthetic marijuana”) has decreased in all age grades surveyed since 2012, when the survey first started tracking use of these drugs. Non-medical use of prescription pain relievers was down significantly from five years ago and heroin use was at its lowest levels in the history of the survey —a bright spot in the current opioid crisis that continues to strongly affect other age groups. However, while unchanged since last year, non-medical use of the prescription stimulant Adderall remains high (7.5 percent of 12th graders and 5.2 percent of 10th graders reported non-medical use of this medication). It was also reassuring to see that, despite concern that wider availability and softening attitudes towards marijuana would lead to increased use by teens, use has remained relatively stable over the last decade. We cannot become complacent, however. Marijuana use still remains high among teens, who stand to be adversely affected in the long term by the drug’s probable effects on brain development. Six percent of high-school seniors use marijuana daily or almost daily, which could have detrimental impacts on their present functioning and their future prospects. And increasing numbers of teens think marijuana use is not a risk to a person’s health, indicating a lack of awareness of the potential for this drug to harm the developing brain. Another point of continued concern is that past month use of e-cigarettes remains high (with 9.5 percent of 8th graders, 14.0 percent of 10th graders, and 16.2 percent of 12th graders using these devices). We still do not know enough about the health implications of e-cigarettes. The nicotine that is in many e-cigarette fluids can be addictive, and while their vapor does not produce the carcinogenic tar of traditional cigarette smoke, it may contain other chemicals that might be harmful to the lungs. There is also concern that vaping may re-normalize smoking behavior and lead to traditional cigarette use among youth who start using e-cigarettes. This will be an important trend to watch for in coming years. For the first time, students in the survey were asked about what was in the fluid they vaporized the last time they used an e-cigarette. Most (over 60 percent across all grades) reported vaporizing “just flavoring.” Among seniors, 22.2 percent reported inhaling nicotine, 6.1 percent reported inhaling marijuana or hash oil, and 6.3 percent said they didn’t know what they inhaled. This too will be important to watch in coming years, especially as more science is conducted on the health effects of flavorings. A few things are important to keep in mind. One is that the MTF survey only captures teens who are in school, not those who have dropped out or been expelled. Thus the annual MTF data possibly underrepresent the total prevalence of substance use; in 2013 the high-school dropout rate was 7 percent among youth over 16 years of age. It is also important to remember that, while no major indicator of teen drug use rose this year, the problems and consequences of substance use in America’s youth have not gone away. Far too many 8th, 10th, and 12th graders continue to use drugs regularly or try them, possibly paving the way for substance use disorders, as adolescence is the period of greatest vulnerability for the brain changes underlying addiction. We are encouraged by the data from MTF, but we should not become complacent. We need to continue to support broad implementation of evidence-based prevention programs, train healthcare providers to identify and treat youth with substance use disorders, and empower young people with the knowledge and resources to live healthy, productive lives. NIDA. "Encouraging News from Monitoring the Future." National Institute on Drug Abuse, 16 Dec. 2015, https://www.drugabuse.gov/about-nida/noras-blog/2015/12/encouraging-news-monitoring-future. NIDA. Encouraging News from Monitoring the Future. National Institute on Drug Abuse website. https://www.drugabuse.gov/about-nida/noras-blog/2015/12/encouraging-news-monitoring-future. December 16, 2015.